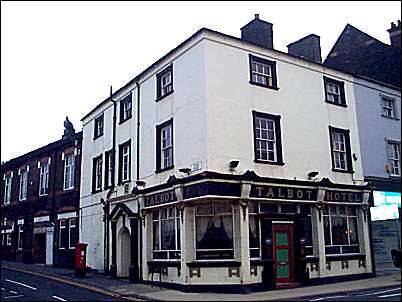 View down Trade Street, the Talbot Hotel is at the bottom left of Trade Street, Church Street runs along the bottom. 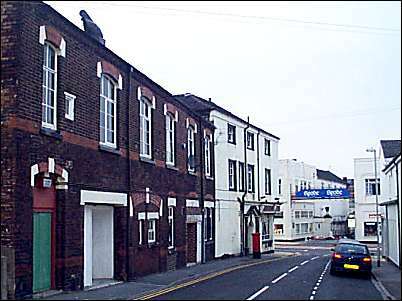 The entrance to Spode pottery works can be seen on the opposite side of Church Street. "A popular working-class activity, especially during the Wakes, was the game of 'prison bars'. It was played between two adult teams of eleven by the music of a flute or tin whistle and drum. The game entailed venturing from a den, and capturing opponents who would be taken into a 'prison' and held there until rescued by one of their team mates. It was not for the faint-hearted, and injuries were commonplace. It was played on fete days on the field - known as Prison Bar Meadow - attached to Norton Hall Farm, whilst a field behind Wedgwood's Etruria Works had been given in perpetuity to locals and that was christened Prison Bars Field. The Staffordshire Advertiser of August 10th 1850 records that during Stoke Wakes, prison-bar matches took place throughout the week on the race-course at Boothen. 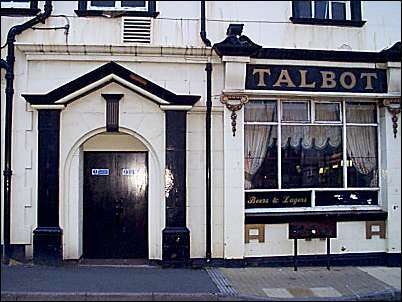 The men of Stoke parish beat those from Burslem parish, and all convened afterwards at the Talbot Inn, where the winners received half a sovereign each, and the losers a silk handkerchief each. There were also contests between factory teams from Stoke, Burslem, Hanley and Longton."